Todd McFarlane here….Unedited and Uncensored! AMA! Hi folks! My name is Todd McFarlane and I am an artist, writer, toy designer, director, producer and entrepreneur best known for my work in comic books, toys and entertainment (film, animation and music videos). I am the creator of Spawn, President of Image Comics, founder of McFarlane Toys and a former Marvel (The Amazing Spider-Man, Spider-Man) and DC Comics artist. I just launched the BIGGEST anniversary issue of my comic book, Spawn, issue #250 as well as finally released the entire Spawn collection (250 issues) in digital format! Also, I recently pushed my way into a new toy isle by creating building (construction) sets with an artistic layer. Many fans will love to hear that I am also back at work on the next Spawn movie! Yes, it’s for real. In attendance: Todd McFarlane and Victoria (from reddit). I'd like to thank everybody for joining in today. And obviously without you great fans, I'm nobody. And I understand that every single day of my life. But here's what I'd like to leave you with: right now, Marvel comics is owned by Disney. And DC Comic Books is owned by Warner Brothers. What that means is neither one of those companies is going to let any of their characters outside of their company. So here's what's happening: Universal, Paramount, Sony, and FOX and a lot of other smaller studios are looking for content. And they can't have a Marvel or DC character - which means they are now knocking on our door. So if any of you have ever thought about putting an idea down on paper - today is the perfect day. Because there is a great hunger for stuff that isn't Marvel and DC right now. We have 17 books that are currently optioned in Hollywood. It can be done. What I tell people is: If you do a book, and if it's the 150th best-selling book - BUT the 149 books ahead of you are Marvel & DC - You have the number one book for all the other studios. So you don't have to be a big-selling book to have people interested in you right now. The studios have to scratch out Marvel & DC and then go "What's left?" and in the top 100 books - that might be #1 to the people at the studios. So I'm telling ya - it is a GOOD time to be an independent creator right now. Thank you guys for taking the time to check out Spawn, our 250 issue digital re-release, and for your ongoing support. We'll be back when I have some specific details about the movie, and we can talk about the movie when we go into production! Hi Todd, back in 2002, I had met you in Edmonton, I was a 16 year old illustrator. My mom had to bring you some of my art because I wasn't old enough to go into the BP's lounge. The next day, I met you at a local radio station and brought you a Spawn drawing I did. You signed it and told me to photocopy it and send in sequential work to you, with it attached so it would come straight to you. "You're a better artist than I was at that age." It was the single most influential thing I had experienced. Unfortunately, I never did send you anything out of fear of my narrative ignorance. I'm happy to say I'm now a comic pro with an Image series under my belt and another on the way this May. My question is, do you recall this (I know you've met countless people and it's highly unlikely you do) and if I can send you some of my sequential work now? Thanks for the inspiration over the years and the work you've done. (And for helping out the Oilers when they needed it!) Cheers, sir. If you have a book at Image, I get all the free books as the president of Image, so I've been reading your artwork already. When I was younger, somebody gave me a chance. And as many times as I can look at young people when I'm traveling that are good that I can help along the way - I try to do that as much as I can. What I never know is what happens when I give them some encouragement and I leave- so congrats to you on making it to the big-time. Tweet your art at me and I'll be sure to respond. If you were brand new to the comic book world today, where would you start? Trying to get paid work with a bigger company? Making your own comic and attempting to publish it yourself or through Image? Web comics? I know you probably have a bias towards Image, just thought I'd still ask as 2015 for comic creators is much different than when you started. So here's my answer: I would attempt to do ALL of them until I got a job. There's a bit of a beggars & choosers here - instead of giving yourself only one option, why not try all of them and cross your fingers and hope that one of 'em works? Again - why limit yourself? I heard rumors that there were plans to conclude “Todd McFarlane’s Spawn” on HBO, what happened? Is there any possibility of concluding the series? Perhaps with a webseries or on Cartoon Network’s Adult Swim? Would you ever do any artist work again for DC / Marvel or any other comics company besides Image? Finally – what do you consider to be the best written comic story ever? Animation - I'm currently working on some more animation, it's not a direct continuation of the HBO series, but it's moving forward in time a little bit, to acknowledge that a decade has passed since the TV show. My hope is that we'll probably get serious about it once we get the movie off the ground, to use it as backup after we're done getting the movie out there, like we did the first time around. As the co-founder and president of Image comics, the answer is no, I will never work for a direct competitor. It's not a dislike of those companies, it's just that they're competitors. I've told people before: if you're the CEO of Ford Motor Company, you don't do work for General Motors. And people don't understand it, but in some cases, it's actually illegal for presidents to work for direct competitors. And for me? De-de-de... I'd say I'm going with back years ago when I was younger, Frank Miller did a series called The Dark Knight. It was a look at Batman as an old man, and how he was still functioning. It was pretty cool. I'm the moderator of /r/Spawn. The 550 user strong, passionate, officially unofficial home of Al and pals here on Reddit. When can we expect the next printing of Spawn Origins Hardcover #1? Do you intend on continuing your hardcover collection throughout the series? I believe collected editions are very important due not only to their popularity with readers today, but because of the legacy they pay homage to. Myself and many others really hope you keep putting them out, even if only to catalogue the work and this great universe you and your teams have created. P.S. 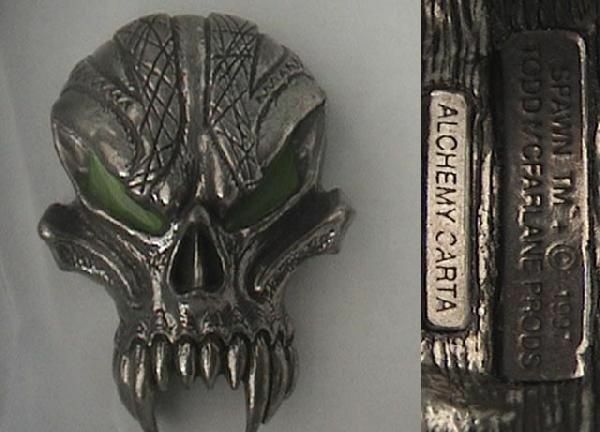 Someone stole my Spawn movie belt buckle when I was a kid. I've been looking for a replacement for over 15 years. Please tell me if you know anyone that has one! 1.) Well, we just released the entire 250-issue library digitally last week, for the first time. I'd been holding out for 2 decades. So we made that move, and we didn't want digital downloads to interfere by putting out a new Origins book. But we'll probably do another Origins book, later in the year, once we let the digital stuff take hold. 2.) Well, thanks for your kind words, and we probably will continue to give you the big thick hardcover books on a regular basis. So look for them. No problem, mate. Thanks for doing the AMA. Big market for these Origin #1 hardcovers on eBay right now (crazy prices), so hopefully we see them from your company sooner rather than later. Good enough for me. Looking forward to having a Spawn bookcase instead of just a Spawn shelf. Hehehe! Well, with 250 issues, and I hope to do another 250, we can fill that library for you. Will Spawn ever return to HBO or Big Screen? I think the answer is hopefully he'll get back on the big screen, and then immediately follow up with him being back on television, not necessarily HBO. I started collecting comics when I was about 16 years old. And then taught myself how to draw superheroes. And... over the course of probably - I went to college, and during my college, I sent out about 700 submissions, and received about 350 rejections, which I still have a lot of 'em, and eventually somebody said yes. So after 350 "no's" I got one "yes" and I was in the business! So persistence and some stubbornness paid off. And it's sort of interesting - I think that we all have some kind of skill in us. And I think maybe - I don't know - but I maybe look at the world slightly different than everybody else, and I take what's in front of me, and twist it, and turn it into some big melodramatic fantasy story sometimes, I don't know. I don't know - people say that, that the industry isn't the same as when I broke in. Here's what i think doesn't change: I think that good skill, good artists, will always find a job. I never have somebody show me great work at a show, and not get their phone number and try to give 'em work. So there's usually 2 things that prevent someone from getting a job. One, they're not very skilled (unfortunately) or two, they're not very aggressive with their career. So if you don't show people your work, they won't know it exists. You can't get shy. You gotta be good, and you can't be shy. what is the most hardest thing you still find to draw? Wow... probably the female figure. You know. Monsters and weaponry is pretty easy, because you can make it all up. And the male anatomy I'm okay at. But I probably struggle with the female one, there's lots of guys that do way better than I do. What would you say is your proudest moment or your greatest accomplishment in your career? Probably in all honesty - just getting that first job. I think if you ask most celebrities or athletes, they probably have clear recollections of their very first time they made it. And so it's - I'm glad I've had a long career, but that career had to start, and if I never got in the front door, I wouldn't have had a career. So I got in! Woo! Although my second would be starting Image Comics! What is your best advice for artist getting discouraged? If you can't take the word "no," you're in the wrong profession. I'm just like a bulldog. So remember - I got told "no" 350 times. I used to go to shows, and I used to carry that bag of rejections, and when I had that question posed to me - when people would say "Oh, I got told no 3 times" and I would dump out my bag and say "If i had quit after 3 or 10 or 15 times, i wouldn't have the occupation. I know it's easy to get discouraged, but you have to decide if you want to be in that business." And at some point you have to decide, come hell or high water, if you want to stay in the business. As a former owner of the Edmonton Oilers, what's your opinion of the team under Katz's ownership? Is there anything you would change immediately? Well, you know, the Oilers (for the people out there) are an NHL franchise, so they've fallen on sort've tough times here, since we sold it to the new guy? So he gets to make the decisions, he's the boss now. And I would probably change a few things, if I were the boss, but I'm not, so I'll let him have all the credit and the criticism, because it's his game right now. Does Rob Liefeld do the best Todd impression? Oh yeah, by far! Yeah, he's awesome. But if anybody wants to do a Todd impersonation, you just cross Sylvester Stallone with Homer Simpsons, and you have it. Well, Greg was already in the industry. So I, you know, I just helped him along, you know, and there's been plenty of others whom I've been able to work with and they went on and did bigger and better - guys like Brian Bendis, Alex Maleev, Steve Niles, Philip Pan, etcetera. I've had some good luck with young talent going on to bigger and better. Props from a fellow lefty! 1) What do you consider the best thing you ever wrote? 2) What do you consider the best comic you've drawn? 3) Do you think you're artistic talent/creativity helps with business decisions, since you tend to come from a different direction? You know, again, going back - I'm naive enough to think that the future will be my better artwork. I still think it's in front of me. But I wrote - I don't know what issue it was, it might've been #27 or #28, it was a single contained story about a dad who was abusive to his kids - so a bit of a personal story about just some topics that got me wound-up - so I thought that issue from a storytelling perspective was really good. And I thought Spider-Man was pretty good artistically. And I think being an athlete - I mentioned that earlier - being competitive, and having to always sort've earn my position made me very focused - not only as an artist, with my deadlines, but also now as a businessman. I've been a fan since your Marvel days, but I'm (as many are) quite fond of Spawn. Do you think that you would at some point (Like Marvel NOW or DC52) do a complete reboot back to #1? Thanks a ton, hope you enjoy the AMA! The simple answer is: no, never. And the bigger reason is? Everybody, all the other companies have been doing that. And so currently I have the highest numbered book in the Nation. So issue #250 just came out. And the only way to get the 250 issues is you have to put in over 20 years of your life. One per month, times twenty years, still isn't even 250. So I'm not willing to throw away 20 years of my life for an arbitrary number in the corner of my book. Image is having somewhat of a renaissance these days. Is the goal to beat out the big 2? No, the goal is to (and has been, since 1992, when we created it) create an option for creative people who are tired of working for the big corporation. Image Comics has the best creator deal on the planet. And I can say that because we own nothing. We own nothing. All we do is publish their work. We take a little bit of money, and the rest is yours. It's the best deal in entertainment. And people are finally waking up to it. Thanks for doing this AMA, all the people I know who like drawing, when young, started "copying" certain artist/comic/cartoon styles, what did you copy or draw like when you were a kid? I did the same, to teach myself early-on, comics. I had 3 or 4 favorite artists that I would try to emulate their work. John Byrne, George Perez, Marshall Rogers, and Gil Kane. But at some point, you have to start developing your own look - so it's okay to start by looking at others, but you have to come up with your own style eventually. Concentrate on storytelling more than any other element (which simply means don't worry about drawing pretty pictures - make an engaging story). In the late 90's the comic shop in my neighbourhood held a art competition for spawn. The winners art work was suppose to be sent to you. Did you ever receive it? Without seeing it, it'd be hard for me to say, because we get dozens of submissions every week for the past 20 years. But i hope I did! But without being able to look at it, I can't confirm. Hello Todd! First off, I wanted to say thank you for all the content you have put out, for all the things you have done for comics, and to congratulate you on all of your success! I have been reading comics for quite some time now and you are not only one of my favorite authors, but also one of my favorite artists as well, and it has been great seeing you not only develop as a businessman but also seeing Spawn develop and go in new directions. I some questions for you, if you dont mind. What do you see in the future for Spawn and for Todd McFarlane Entertainment, regarding movies, TV shows or new lines of figures? What new directions will you be heading in, do you have any plans for things you want to do next? Can I ask what your relationship is with the other Image partners? What do you think of Image in general, and the content that is being put out by them? One more question: How can I get something signed by you? That would be totally awesome! We hope to get out a new movie, a new animation, and actually there are some other properties I'm talking to Hollywood about, hopefully, and we just started our new line of building sets in the toy category that are based on Walking Dead and we got a big license coming up we're going to announce in a couple months. I like all of our partners. I wish that Jim and Rob were still with us, but we're 20+ years with us, and having a good time, especially with the addition of Robert Kirkman. Yeah, I do lots of autographs, so if we happen to meet, I'd be more than happy to do that. As far as the painting, you know, I sign off on what the final colors are gonna all be, but we mass produce them, so there's a whole group to help paint those, not myself personally. If they ever "rebooted" and made another Spawn movie - Which actor do you believe would be the worst pick to play Spawn ? I'd probably say Charlie Chaplin (since you didn't say dead or alive). Number one, he just didn't have the physique. Number two, I don't think the mustache would work for the girls these days. Number three, he never spoke since he was in silent movies, so I don't think he could deliver his lines. Hey Todd, love your work. The Spawn fan film "The Recall" is about to reach 1M views on YT in 4 months. Did you see it? What do you think about it? Yes, it's a video that somebody did doing like a 5 minute movie take on it? And it's pretty good! I applaud the effort put into it, and it has gotten lots of views, so I tip my hat to the person who did it basically out of enthusiasm, because I'm sure nobody paid them, but it also shows that people are hungry to actually get a full-length feature. So my wife is making sure I get that script done here. What was it like to work alongside Dave Sim on Spawn #10? Dave's a very original individual. So it was sort've fun taking a non-superhero guy and letting him play in our sandbox for a while. AND to pat Dave on the back - he did 300 issues of his comic book, called Cerebus the Aardvark. He did 300 issues. When he started it he said he was going to do 300, and he did 300. So it's a staggering amount of work that he did. BUT - my goal is to get at least 301 issues of Spawn to break his record! He owns the record for the longest run of an independent book, and I want to hold that record someday. What peanut butter to jelly ratio do you like PB&J sandwiches? I'm not a peanut butter and jelly guy. I just like peanut butter. So I leave off the jelly or honey. Every now and then I'll mix it with Nutella. Hi Todd huge fan! Just wondering what inspired Spawn for you and what your thoughts are on how it has been received by the public? Thanks! The easiest thing to write about is yourself. So... there's a tip. You want to write a story? Do something you really know about, and then just make it very dramatic. So here's the goal with Spawn: I hope the book keeps going even after I die. I hope I am able to create a couple of ideas that live past my lifetime, and to me that's my goal - to create ideas that live longer than I do. I call them my "creative children" and you hope they outlast you. How do you think the current generation will take to Spawn? Back when it came out on HBO the world really didn't have many dark protagonists around. Now that Nolan's Batman showed that super heroes aren't all super and struggle with inner demons like we all do. I've never been a believer in the idea that there's a sort of time or a generation doesn't like any type of movie, or any type of genre. What I think happens is that they don't like bad versions of any of those genres. So do I think there's room to do dark gritty characters? Yeah, sure - you just have to do a good version of it. And my pressure is I'm going to have to do a good job, and if I don't, people won't show up. Hi Todd, I just purchased some 3 inch NFL figures for my desk at work. They are the perfect size to display in the office. My question is will you be rolling out any new series of the 3 inch figures anytime soon? Would love to buy more players in their famous poses (A la Odell Beckham famous catch). Thanks and keep up the awesome work! No plans for 3 inch sports figures right now. I mean, we have the bighead guys, I don't know which ones you've got? But if you're looking for realistic small figures, our building sets come with highly detailed small figures, and you can buy them individually as well. So I was wondering, how often do you model your characters after people you know? And well, are there any others you can point out? Well, some artists may do that more than I do, with the constant pressure of a deadline? It's part of creating your own style, you just have a bunch of faces in your brain, and you pull 'em down, and if they happen to look like somebody - because i get mail all the time that says "It looks like my next door neighbor!" and I'm like "Well I never met them" - I'll draw generic fat guy, or generic skinny guy, or generic beautiful lady, but they're not meant to be anybody specifically, just doing people. Ok first off your Spider-Man was one of the reasons I love Spider-Man!! My question is what will you be doing June 20 2015 my wife and I are getting married abd would love if you came :) we live in Houston TX. I also have a wire sculpture I made of spawn for you. How or what's the address to send it to you? Hope your day is going great. Oh abd thanks for the art tips on your page and spawn is just an amazing character! Send the invite to my office - I think we have the address at Spawn.com or even on our Facebook! I don't know if I'll make your wedding, but I do know the proudest day of my life was the day I wed my wife - I met her when she was 13, married her when she was 20, and we'll be celebrating our 30th anniversary here in July! The love of a good woman will get you through, I think, anything. So hopefully you hold onto this woman for the rest of your life. For the Spawn movie, is the producers going for the fan loved R realm that Spawn needs or will it be an intense PG-13 like Dark Knight? Also love your art and story concepts. Inspiration in every form imaginable. So here's the deal: the deal I've made is I write / produce / direct the next Spawn movie. So because of that, it will be a hard R. A supernatural drama. And the only thing - just so everybody's clear - the only thing that will be out of the ordinary in this movie, that won't be the world you know, is that there will be this thing moving in the shadows that you & I know will be Spawn. So it's more of a ghost story. And less a superhero movie. Todd, now that you have established a relationship with Ubisoft, are you considering other video game properties of theirs, such as Watch Dogs? Have you considered other games like The Order 1886, or Uncharted? You know, the big answer is: we're constantly searching for license in any field. Whether video games, TV, movies, we're always looking. So the answer is yes - it might not be any of the ones you mentioned, but we're always keeping our eyes open. How many hours a day do you draw? Including work, practice, just for fun. Average amount of time spent putting pencil to pPer. You know, since I run a couple different companies, each day varies. So some days are my drawing days, and some days are my business days, and some days are a mixture of both. But I still do a fair amount of drawing. The biggest difference today from when I was younger is everything I drew when I was younger was turned into a comic book, and today, a lot of what I draw is concept work for some of my other companies - for video games or stuff like that, so it's behind the scenes drawing. Hello Todd, I am actually a fan of the 90s Spawn movie, and just re-watched it last weekend with my Son. My question is, now that Spawn is available Digitally, where is a good place to jump in if I wanted to go back a few years? Wow... well, issue #185, the original Spawn character kills himself, and a new person has to take over, so from #185-250, there's the entire buildup of this new character until we get the original one back, at the end of issue #250. So that's not a bad table-setting place. Todd, you did some great Terminator figures. Are you looking forward to T5 (Terminator Genisys)? Yes, we are! All the franchises I grew up on. I'm always curious to see how they do a new version of them. Hi Todd, You often talk about that you sent hundreds of letters to companies until you got a job in the comicbook industry. Can I play the same stuff with Image Comics after I get a bit better and start my first, more serious attempt at creating a comic? Would Image be interested in a manga influenced series? Speaking of manga, do you plan to make any figurines of a manga or anime series? A construction kit would be amazing. Image is always interested in good stories done at a professional level. So if you think you fit that bill, then send your stuff in. We're in the business of finding talent, and great stories. But no plans for any Manga toys right now. Mr. McFarlane I'm a big fan of your sport figurines, will you be keeping them going & if so can you bring back the college editions? Yeah, you know we recently let go of hockey - which, as a Canadian, that one broke my heart - but we still have Basketball, or the NBA, the NFL, and MLB, so the college we'll be doing from time to time, but not on a regular basis. Are you planning on completing Abraham's Trio in their first costumes? Hoping for a Rosita! You know what? Eventually we'll get around to all the cool stuff. The tough thing of making toys is trying to please everybody, because everybody has something a little bit different that they want. what is the best comic book cover in your opinion and also one that you've created? You know, it's funny - I don't think most artist sit back and go Gosh, what's my very best stuff I've ever done?! Here's what I think most of us artists do: we always think TOMORROW Is gonna be our best work. And eventually - we never attain it - all we do is try. We chase the elusive perfection. BUT the upside is - it's what keeps us going, for decades. I really want an Image Comics shirt, but none of my local shops say that they can get one. As an Oakland resident, can I just walk into Image HQ and ask for a shirt? Um.... I don't think we have t-shirts hanging around the office? You might be able to walk in, but we don't have any t-shirts. We promote different creative people but not Image Comics per se. I read that you played baseball in college. What position did you play? Also I'm super jealous that you have Mark McGwire's record ball. He was a favorite of mine. Yeah, I played my last 3 years, I played up in the state of Washington. As a skinny left-handed centerfielder. I was the fastest guy on my team, so I could steal bases and catch baseballs. The hitting was inconsistent. BUT be thankful the hitting wasn't good, because that's why I'm a comic book artist now. Is there any sort of time-frame your looking at for the movie? Is it all script and conception so far or are you looking at directors, cast, ect? As far as video games go, I know it makes sense to see how the animation and movie go but should they take off, would you consider going that route? The Super Nintendo Spawn game was one of my favorites when I was a kid. The plan is to finish the script here in the next couple of months. And then do a couple of rewrites on it. And then after that, if the story is good enough, the rest of the pieces of how you get to making your movie should go fairly quickly. So I've got people in Hollywood waiting, I've got some big actors, some that have won Academy Awards waiting, I've got people behind the camera waiting, so they are just waiting for my script. So once we get the script finalized and in good shape, we'll be able to give you a lot of news really fast about when it's coming. And yes. I've been the art director on a couple video games - and it's another form of art I like to tackle. I like to dabble in all areas of art. In the Walking Dead figure vote, is it just top 1 that will be made? Yes. And again, just so people know, the popular Walking Dead TV show came from a comic book that Image comics has been doing for over 10 years now. So we've been Walking Dead fans for a long time now - way ahead of most fans out there! In fact the creator of Walking Dead, we brought him on as a partner at Image Comics. Do you think that we'll see Image United completed, and where do you stand on the project? It may get completed, but it would have to be because one artist would have to take it on and finish it themselves? But under the current way we were doing it, it may languish a little bit longer. What were your favorite comic book characters as a kid? Any particular favorite stories / issues? What are your favorite comics as an adult? Hmmm... I like Batman. I like The Thing, from The Fantastic Four. I thought Iron Fist was kinda cool. And then probably my favorite book I read was a book called "Tomb of Dracula" - I had the whole series. In your view, is it possible today to have a comic book done by one single guy? How does that experience may vary from what there was in the 80s and the 90s? I've been a fan of Spawn since the revenge chapter on Chapel. Great, great issue, sir! A single person can do a comic book - there are lots of people who are living proof, I'm one of them. You just have to be very, very fast and disciplined. So yep - how i used to get a book done, in one month. Week 1: write the book. Week 3 & 4: Ink all the pages, and get them colored. So is it doable? Yes. Is it a lot of hard work? Absolutely. What is your favourite type of pie? Probably Key lime. I like sour stuff.